SBI Clerk Govt Job 2019 Syllabus Check Here. SBI Notification is out. SBI is recruiting for 8904 Clerk Govt Job Posts. 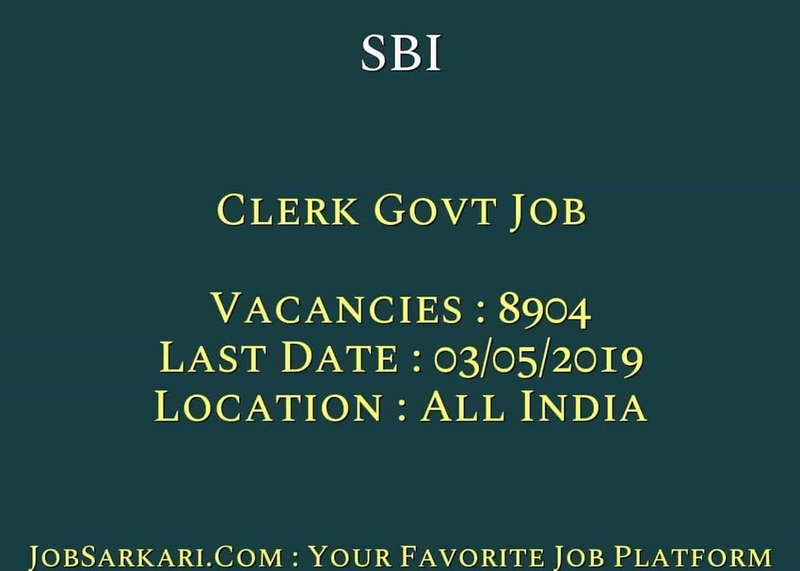 You can check SBI - State Bank of India last date, download SBI notification, visit SBI official website and check other SBI Vacancy details.Complete Vacancy and recruitment Details about 8904 Clerk Govt Job vacancies in SBI are provided below by JobSarkari.Com only for you. Last Date of Apply Online. 03/05/2019. Last Date of Pay Fee. 03/05/2019. Date of Preliminary Examination. June 2019. Date of Main Examination. 10/08/2019. Mode of Payment. Candidate Need to Pay Fee Through Debit, Credit Card And Net Banking or E Challan. Gujarat. 164. 41. 110. 28. 67. 127. 537. Dadra And Nagar Haveli. 06. 00. 00. 00. 03. 00. 09. Daman And Diu. 05. 00. 01. 00. 00. 02. 08. Andhra Pradesh. 103. 25. 68. 40. 17. 00. 253. Karnataka. 200. 50. 135. 80. 35. 00. 500. Madhya Pradesh. 168. 42. 63. 63. 84. 57. 477. Chhattisgarh. 94. 23. 13. 27. 73. 00. 230. West Bengal. 228. 56. 124. 129. 28. 00. 565. Andman And Nicobar Islands. 16. 02. 07. 00. 02. 00. 27. Sikkim. 06. 00. 01. 00. 01. 00. 08. Odisha. 140. 35. 42. 56. 77. 00. 350. Jammu And Kashmir. 19. 04. 10. 03. 04. 00. 40. Himachal Pradesh. 55. 13. 26. 33. 05. 00. 132. Chandigarh. 18. 03. 09. 06. 00. 00. 36. Punjab. 137. 33. 70. 97. 00. 00. 337. Tamil Nadu. 183. 42. 113. 79. 04. 00. 421. Pondicherry. 03. 00. 01. 00. 00. 00. 04. Delhi. 180. 43. 117. 65. 32. 00. 437. Uttarakhand. 105. 18. 23. 33. 05. 00. 184. Haryana. 70. 14. 40. 28. 00. 00. 152. Telangana. 172. 42. 114. 68. 29. 00. 425. Rajasthan. 240. 60. 120. 102. 78. 29. 629. Kerela. 131. 24. 66. 24. 02. 00. 247. Lakshadweep. 02. 00. 00. 00. 01. 00. 03. Uttar Pradesh. 493. 119. 322. 250. 13. 00. 1197. Maharashtra. 344. 78. 210. 78. 70. 00. 780. Goa. 13. 02. 03. 00. 02. 00. 20. Assam. 132. 30. 81. 21. 36. 00. 300. Arunachal Pradesh. 26. 05. 00. 00. 24. 02. 57. Manipur. 05. 01. 01. 00. 03. 00. 10. Meghalaya. 11. 02. 01. 00. 11. 07. 32. Mizoram. 05. 01. 00. 00. 04. 09. 19. Nagaland. 18. 04. 00. 00. 18. 00. 40. Tripura. 05. 01. 00. 01. 03. 18. 28. Bihar. 54. 11. 31. 18. 01. 00. 115. Jharkhand. 95. 23. 28. 28. 61. 00. 235. Kashmir Valley. 14. 03. 08. 02. 03. 00. 30. Leh And Kargil Valley. 14. 03. 08. 02. 03. 00. 30. Total Vacancy. 3674. 853. 1966. 1361. 799. 251. 8904. Candidate Must Have Passed Graduation or Equivalent. 9. Online Applications Can Be Submitted on Or before 03rd May 2019. Q. What is the Last Date For SBI Clerk Govt Job Vacancy ? A. 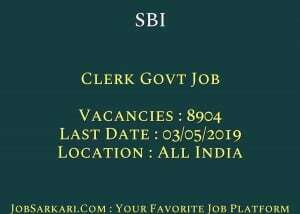 Last Date for SBI Clerk Govt Job Posts is 03/05/2019. Q. What is the Form Type of SBI Clerk Govt Job Recruitment ? A. The Form Type for SBI Clerk Govt Job Posts is Online. Q. How many vacancies are available in State Bank of India Clerk Govt Job Posts ? A. There are about 9000 Vacancies in State Bank of India Clerk Govt Job Posts. i am 33 years old person and having experience in banking. May i have the opportunity to apply for clerk post in any other bank?